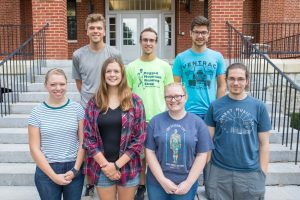 Seven first-year Eastern Mennonite University students studying in science, technology, engineering and math (STEM) fields have been awarded scholarships funded by a National Science Foundation grant. The $600,000 grant will also fund seven more students next year, as well as support services and activities for students both years. The scholarships may be renewed for up to four years for eligible students. The grant recipients are members in a cohort in EMU’s STEM Scholars Engaging in Local Problems (SSELP) program, which fosters real-world impact through socially engaged learning. 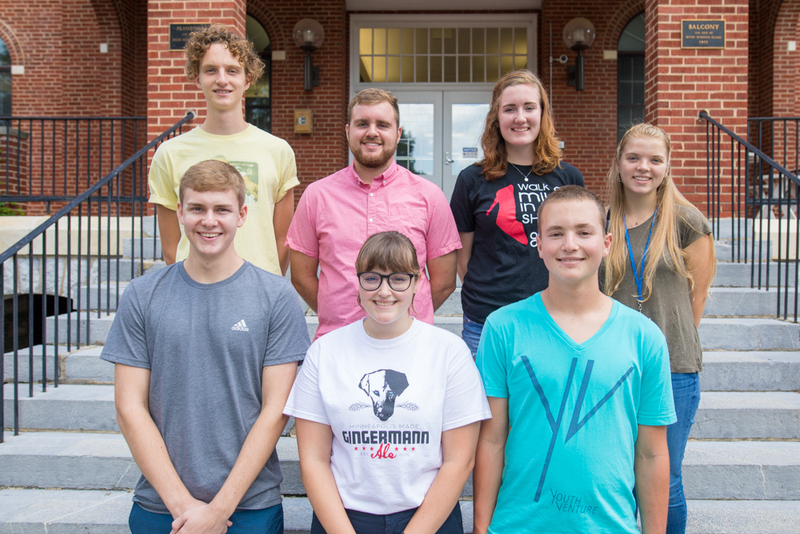 SSELP peer mentors are (top, from left) James Paetkau, Collin Longenecker and Dylan Grove, and (front, from left) Leah Lapp, Erin Brubaker, Bekah Mongold and Elliot Bowen. Program participants are paired with mentoring juniors and seniors majoring in the same areas, said Professor Tara Kishbaugh, who chairs the biology and chemistry departments. “The combination of intentional community and informally shared insights, such as into the policies and culture of the STEM departments, often helps student engage more fully in the first year of college,” she said. Jacob Horsley (Johnstown, Pennsylvania) was part of a high school STEM competition team that designed a walker that enabled climbing stairs. He chose EMU for its “focus on community, sustainability and cultural experiences,” he said. He is studying mechanical engineering, with minors in Spanish and environmental sustainability. Jacob Myers (Pettisville, Ohio) loves nature and especially birds – and realized in his senior year of high school that “this hobby has the potential to be a job,” he said. He’s double majoring in environmental sustainability and Bible, with a minor in Spanish, and plans to be a missionary, field researcher or park ranger. Anna Paetkau (Goshen, Indiana) attended a marine biology trip in her final two years of high school that “solidified my love for the ocean, biology and research,” she said. Now studying biology with minors in Spanish and honors, she is looking forward to conducting research with her professors. Her career goals include researching how changes in temperature and salinity affect marine organisms. Andrew Schunn (Phoenix, Arizona) is studying mechanical engineering, in part after being inspired by a high school calculus teacher who described compelling career choices in engineering. He has appreciated the “extremely nice” people and small class sizes.